I was thrilled when Teenage Nephew 1 grew old enough to mow my yard. We nego­ti­at­ed a price and then head­ed out­side. I knew that at his house, his father was King of the Rid­ing Mow­er, so mow­ing was a com­plete­ly new skill to Teenage Nephew. So I care­ful­ly reviewed the basics with him: mow­er oper­a­tion, safe­ty issues, how he shouldn’t plow over my rose bush­es. It nev­er occurred to me that I need­ed to teach him the con­cept of a straight line. As I peeked out win­dows, mon­i­tor­ing progress and watch­ing for any trou­ble, I began to notice a strange pat­tern emerg­ing. Zigza­gs and curves of mowed grass dis­sect­ed clumps of uncut lawn. Some sec­tions remained untouched while he re-mowed oth­ers five or six times. Even in the thor­ough­ly mowed sec­tions, peri­od­ic “lawn mohawks” popped up across the land­scape. 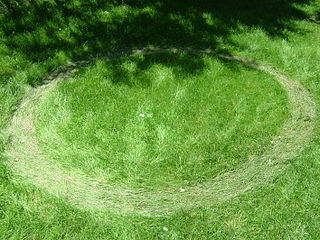 It was like a dis­or­ga­nized alien had land­ed to cre­ate Picas­so-esque crop cir­cles in my yard. It even­tu­al­ly occurred to me that my nat­ur­al incli­na­tion towards order­li­ness and effi­cien­cy had in this case skipped a gen­er­a­tion, and I stopped the yard work long enough to do a little les­son on mow­ing in a grid pattern. But the image of those lawn mohawks are a fun­ny and use­ful reminder to me when I set out to teach young peo­ple writ­ing, too: not all stu­dent brains are hard­wired the same. When I remem­ber to peri­od­i­cal­ly mix up my approach— ﬁnd­ing activ­i­ties that appeal to stu­dents who learn dif­fer­ent­ly than I do—I have more suc­cess engag­ing them in the act of writ­ing. Dif­fer­ent learn­ing styles might throw you some curves as a writ­ing teacher, but remem­ber: there are ways to write and teach around them.